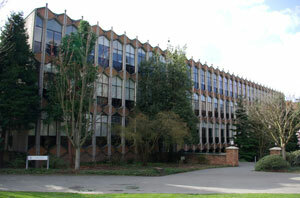 The University of Washington's department of Human Centered Design & Engineering is located in Sieg Hall, on the southwest corner of the Husky Union Building (HUB) lawn, just south of Allen Library. If you are parking in Central Garage, take the Gerberding Building exit and walk toward the fountain (with Red Square behind you). Turn left before Mary Gates Hall and continue under the Allen Library overpass. Turn right and you will see Sieg Hall on your left after passing Allen Library. The Seattle Metro public transportation has an excellent trip planning website. The closest bus stops to Sieg Hall are at (in order of proximity) 15th Ave NE & NE Campus Parkway, NE 41st St & University Way NE, and at Stevens Way & Pend Oreille on the UW campus. The closest parking garage to Sieg Hall is the Central Garage beneath Red Square. To get to the Central Plaza Garage from I-5, take the NE 45th Street exit (#169). Turn East onto NE 45th Street. Continue East about one quarter of a mile to 15th Avenue NE and turn right. Head South on 15th Avenue three blocks to NE 41st Street. Turn left at Gate #1 into the Central Plaza Garage. Stop at the gatehouse inside the garage for directions and a parking permit. For information on parking fees, please visit the UW Commuter Services website. The University of Washington is committed to providing access, equal opportunity and reasonable accommodation in its services, programs, activities, education and employment for individuals with disabilities. To request disability accommodation contact the Disability Services Office at least ten days in advance at: 206.543.6450/V, 206.543.6452/TTY, 206.685.7264 (FAX), or email at dso@uw.edu.